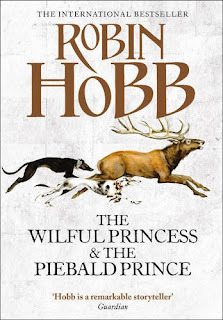 I've always loved Robin Hobb's Realm of the Elderlings books, and when a friend was kind enough to lend me The Wilful Princess & The Piebald Prince I was happy to have the chance to revisit. Through all the novels, especially the Farseer and Tawny Man trilogies, one story is repeatedly referenced: that of the seduction of a Farseer princess by a Witted commoner, and the subsequent disastrous reign of the Piebald Prince. So in a sense, this book is a defictionalisation, as we never get to hear the tale in full in the novels proper - as well as a record of what really happened, as opposed to the folklore's version. Predictably enough, it's rather different. It's narrated by Felicity, the daughter of the wet nurse to Princess Caution, who becomes her childhood companion. Ah, the Farseers. Their naming conventions are possibly the worst for irony (as you might expect from a novel featuring Caution as the titular Wilful Princess). She's an engaging narrator - deeply flawed, very (even if unconsciously) ambitious, and nonetheless adoring Caution. It's a good mix, and you're soon drawn into her story, in which the myth of an evil witted sorcerer becomes a series of unwise decisions and a political quarrel. And very convincingly, too, making the anti-Witted prejudice of the Farseer trilogy even more tragic. The Wilful Princess does assume a fair amount of knowledge of the existing books, despite technically being a prequel. It would make sense without having read the Farseer trilogy, but most of the broader implications would be lost - and many references, such as those to the Skill, go entirely unexplained. It's an engaging story, yes, but largely for its exploration of the origin of this tale in the wider setting, so even if it's set before the first trilogy, I would firmly recommend reading this later. Besides, that way you get the joy of those moments when you realise a beautiful explanation has just taken place. It's also a short book. That's not something I thought I'd ever say about one of Hobb's works, but it's true, weighing in at 157 pages in the copy I'm reading. That said, it's also a beautiful book - the illustrations (mostly of animals) are lovely and blend well with the text. I can imagine it's a delight to own, especially if you're going for the complete set, but unless you've read a substantial amount of other Hobb, I wouldn't recommend buying this one, as it's far less essential. But what about the story itself? Well, I'll try not to spoil too much, but it relates the true story behind the legend: of the childhood of Princess Caution, Felicity's relationship with her, and her son, the Piebald Prince. Felicity is wonderful - she's very engaged in the story she's telling, even when third hand, and frequently interjects to insert her own opinions, as well as how the story might be told by those less in the know. She's a great character, too: she might love Caution, but is also deeply selfish in doing so, and her role as both manipulator and manipulated in the tragedy is a very interesting one. And of course it's a tragedy - that's a foregone conclusion. However, there's less space left for the other characters, some of whom are portrayed in very broad strokes. In such a short novel, Hobb's normally wonderful characterisation is reserved only for a few. That's not to say it's bad. It gives it an almost fairytale-esque air in itself, and I enjoyed that, racing through the novel. 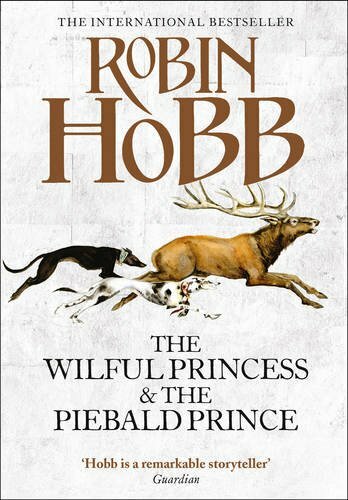 All told, I'd thoroughly recommend The Wilful Princess & The Piebald Prince to seasoned Hobb readers, or at least those who have read the Farseer trilogy - it's an engaging little fable that offers a tragic insight into Hobb's world, and the origins behind the anti-Witted prejudice in the Six Duchies. However, I would advise reading the others first, as the book has little room for introducing itself, and perhaps borrowing rather than buying unless you've already acquired a bit of a collection, as it is a short (though beautiful) book and less significant than the others, with far less depth of characterisation. It is a lovely addition, rather than a main feature in itself. So what's next? It could be Fool's Assassin, but it might be another look at Anansi Boys, which I'm currently loving the audiobook of (it's read by Lenny Henry, and is really doing a spectacular job so far). I'll also be writing about Sunless Sea, a game - so slightly off my usual track.